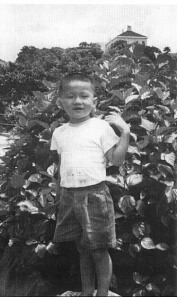 Jackie Chan was born in Hong Kong on April 7th, 1954. 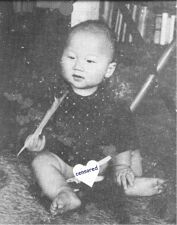 His parents, Charles and Lee-lee Chan named him Chan Kong-sang which means "born in Hong Kong." 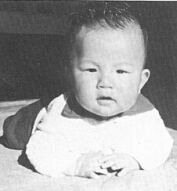 Jackie weighed a whopping 12 pounds when he was born and his mother required surgery to deliver him. Jackie's parents were so poor that they had to borrow money from friends to pay the doctor. Although Jackie's parents were poor, they were lucky enough to have good jobs at the French embassy in Hong Kong. Charles was a cook and Lee-lee was a housekeeper. 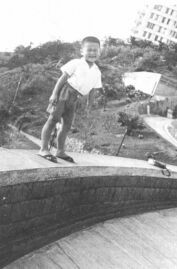 Together, the Chan family lived on the Peak in Hong Kong. 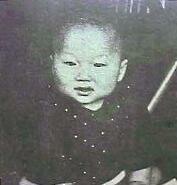 When Jackie was little, his father would wake him early in the morning and together they would practice kung fu. 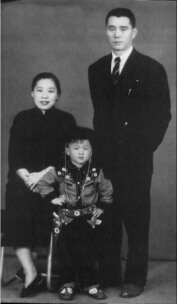 Charles Chan believed that learning kung fu would help build Jackie's character, teaching him patience, strength, and courage. When Jackie was 7 years old his father took a job as the head cook at the American embassy in Australia. 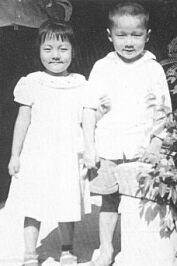 He could not bring Jackie with him, so he enrolled him in the China Drama Academy where Jackie would live for the next 10 years of his life. 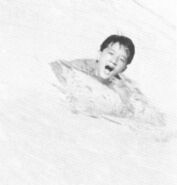 During Jackie's time at the school, he learned martial arts, acrobatics, singing, and acting. 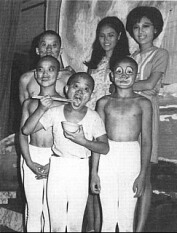 The school was meant to prepare boys for a life in the Peking Opera. Chinese opera was very different from any other kind of opera. It included singing, tumbling, and acrobatics as well as martial arts skills and acting. Students at the school were not treated kindly at all. They were given just enough food to survive. They were beaten if they disobeyed or if they made mistakes. It was a very harsh and difficult life but Jackie had nowhere else to go, so he stayed. He hardly saw his parents at all for many years. 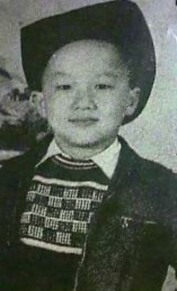 During his time at the China Academy, Jackie made his acting debut at age eight in the Cantonese movie "Big and Little Wong Tin Bar." He later teamed with other opera students in a performance group called "The Seven Little Fortunes." 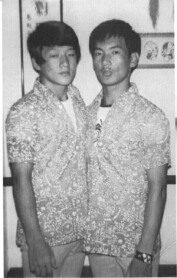 As Jackie got older he worked as a stuntman or an extra in the Hong Kong film industry. 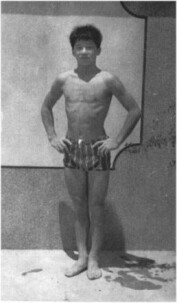 Over the next few years, Jackie worked as a stuntman in Hong Kong. When the Hong Kong movie industry began to fail, he was forced to go to Australia to live with his parents. He worked in a restaurant and on a construction site. It was there that he got the name "Jackie." A man named Jack who worked on the site had trouble pronouncing "Kong-sang" and started calling Jackie "little Jack." That soon became Jackie and the name stuck. Jackie was very unhappy in Australia. The construction work was difficult and boring. One day Jackie received a telegram from a man named Willie Chan. Jackie didn't know it but Willie would end up becoming his best friend and manager. Willie Chan worked in the Hong Kong movie industry and was looking for someone to star in a new movie being made by Lo Wei, a famous Hong Kong producer/director. Willie had seen Jackie when Jackie was working as a stuntman and had been impressed. Jackie called Willie and they talked. Soon Jackie was on his way back to Hong Kong to star in "New Fist of Fury." It was 1976 and Jackie Chan was 21 years old. 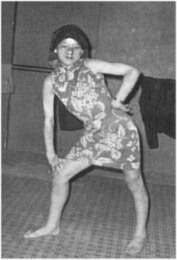 Once Jackie got back to Hong Kong, Willie Chan took control over Jackie's career. To this day Jackie is quick to point out that he owes his success to Willie. The movies that Jackie made for Lo Wei were not very successful. The problem was that Jackie's talents were not being used properly. It was only when Jackie was able to contribute his ideas that he became a star. He brought humor to martial arts movies; his first success was "Snake in Eagle's Shadow." It was the first movie that Jackie had a part in making and it was a huge hit! This was followed by "Drunken Master" (another blockbuster) and Jackie's first ever directing job, "Fearless Hyena." All were big hits. Eventually Jackie ended up in the United States to make the movie "The Big Brawl." It was not successful. Next came "Cannonball Run" which was successful in the US and Japan, but not in Hong Kong. Jackie was very discouraged and went back to Hong Kong to continue making the action-comedy movies he had become famous for. In 1985, Jackie went back to the States to make "The Protector" which was also a flop. He left the US once again. It would be 10 years before he returned to make the successful "Rumble in the Bronx." After that came "Rush Hour," "Shanghai Noon," and "Rush Hour 2." Jackie Chan had achieved his dream of being a superstar in America.